Genuine Connection Promotions (Pty) Ltd is an apparel manufacturer and supplier of a wide range of sport, lifestyle, corporate and other clothing to a diverse range of clients, including bulk buyers, retailers, resellers, and agents. Having achieved success at home, Genuine Connection’s next step was to go after the international market. 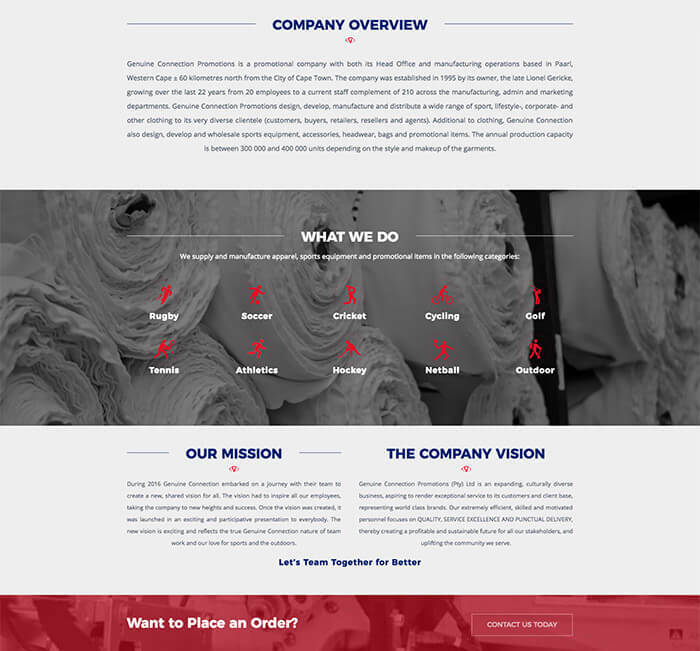 For that, however, they needed a website that was up to international standards and could compete with other apparel suppliers around the world – so they approached The Website Engineer to develop a new website for them with the goal of reaching a broader international market. 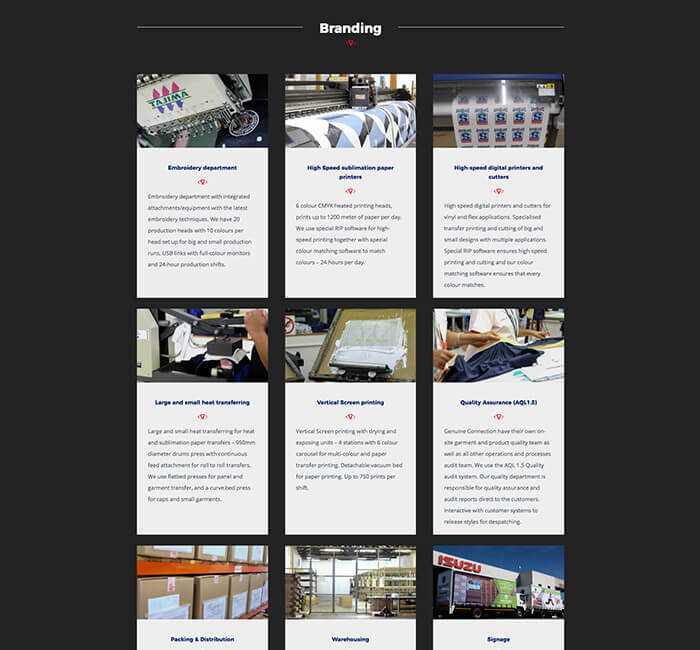 The key goal for Genuine Connection Promotions was to articulate the values of the company, and project their mission in a way that both lived up to international design standards and gave visitors strong reasons to choose them as their apparel supplier. This required structuring a great deal of information in a way that can be digested easily while conveying a sense of professionalism, high standards, and strong company culture. 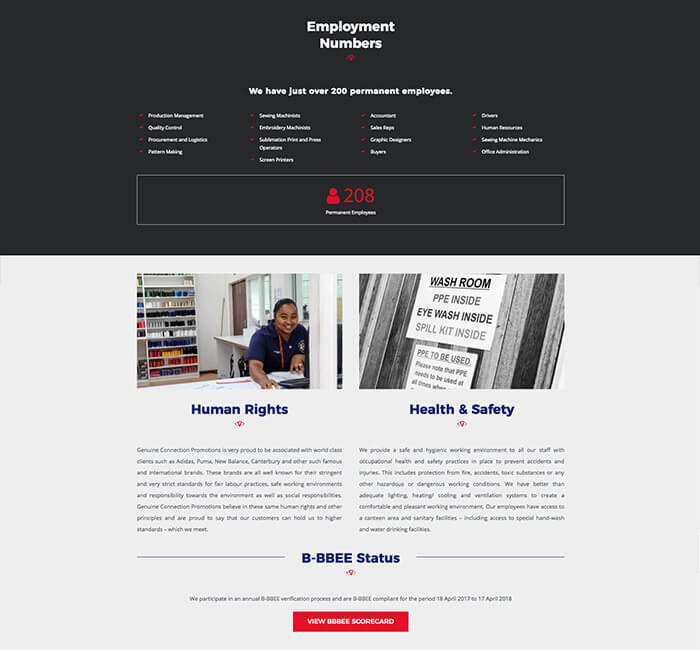 The Website Engineer is no stranger to corporate clients or liaising with multiple stakeholders for a project, which is why we worked happily with managers in HR, marketing, operations and manufacturing to ensure we achieved a faithful company-wide vision on the new site. Designing, developing and implementing a website is only one piece of the puzzle when it comes to the project as a whole, though. 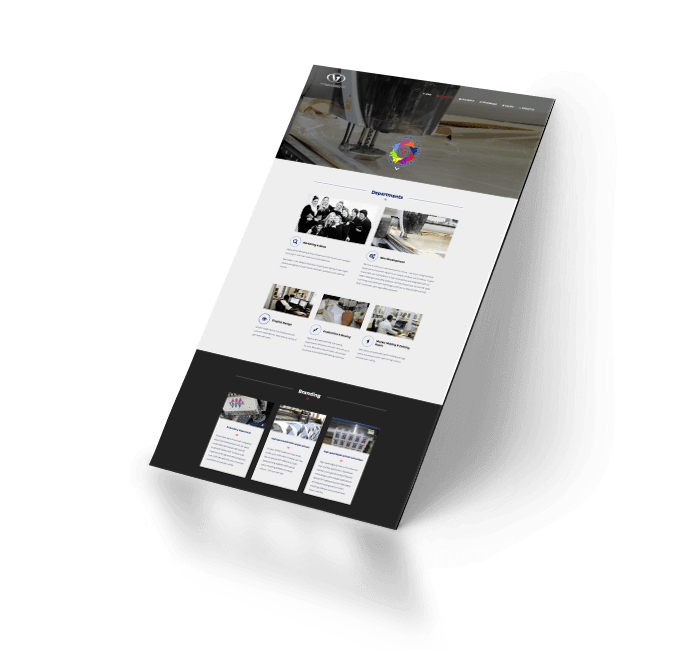 Working with the team and ensuring consistent and smooth feedback loops is a critical factor in the turnaround time for corporate projects – and thanks to our experience and expertise, we’re happy to say Genuine Connection Promotions was one of the smoothest corporate website redesigns we’ve participated in.